Rise to Power Women's Symposium Conference. This is a women's conference that allows the female power suits, movers and shakers and professional woman to remove her super cape and be served. If you always show up like a lioness this is your chance to be a kitten. 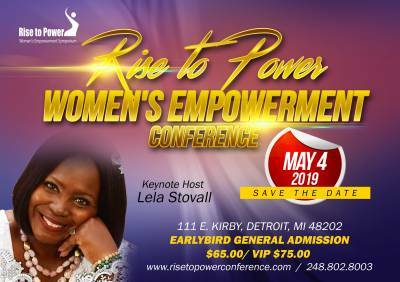 This conference will serve you with inspirational motivation, self care remedies, recharged business ideas, power move business strategies and uplifting testimonies of strength and courage. This experience will embrace the female that needs to renewed, refreshed, replenished and revitalized. Breakout Sessions Include: Personal Finance, Relationships, Entreprenuer & Non-profits, Professional Development and Personal Development. Each breakout session will be 45 minutes of powerful information and action plans on that subject. Exact classes will be available the day of the event. Additional speakers to be announced/. 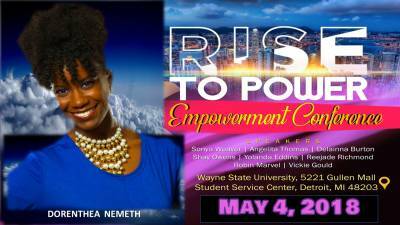 What is an women's empowerment conference? It is when females come together to learn and educate themselves on various topics of interest. Knowledge is power and when you know more, you can do more. Women will be able to participate in live learning experiences that can change their lives. Maybe you are a entrepreneur and you want to learn more about starting a business, financing a business, creating a business plan and more. Perhaps you need information about personal finances, business funding, non-profits you can find it here. This conference is about education and learning while doing some self-discovery. If you have additional specific questions, please email the organization.